At some time in the third century Alban was martyred for his christian faith and buried on a hill top over looking the city of Verulamium. Eventually a shrine or church was built over his grave and the historian Bede, writing c.730 implies that this was done in Roman times and states that miracles still took place there. The Gallic Bishop, St. Germanus of Auxerre visited the shrine in 429. The Abbeys own historians recorded that the Abbey was founded by the great King Offa of Mercia in 793, after the saints resting place had been revealed to him in a dream. However it is unlikely that this had been forgotten by the two generations since Bede's time and it seems likely that Offa reorganised an existing religious community and probably imposed the rule of St. Benedict. He also endowed the house with extensive lands. Little is known about the Anglo-Saxon Abbey but it seems to have had two churches and was a mixed house with both monks and nuns. The Abbey Church today after Victorian "restoration"
Eleven years after the Norman Conquest, in 1077, Paul of Caen was appointed Abbot and set about rebuilding not only the Church but also the conventual buildings. The great church was finally completed and dedicated in the presence of king Henry I in 1115. Most of the building materials were quarried from the ruins of Roman Verulamium. TheChapter House was rebuilt by Abbot Robert de Gorham (1151-66) around the time when the local Hertfordshire man, Nicholas Breakspear, became Pope Adrian IV (1154-9), the only English Pope. It was Pope Adrian who made the Abbey the premier abbey of England. In the period 1195-1235 the church was extended to the west and the west front provided with porches. During this period, in 1213 a council was held at the Abbbey at which Magna Carta was drafted. Later in the 13th century work took place at the other end of the church when the presbytery was extended eastwards (1235-c.1290). A further eastward extension took place early the next century (1308-1326) when the Lady Chapel was built. The existing shrine of St. Alban, now happily restored to something like its former glory, was built c.1302-1308. 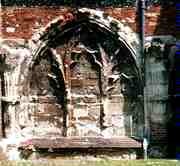 In 1323-1327 five bays of the south nave, along with the cloister, were rebuilt after part of the nave wall collapsed. Abbey buildings revealed as "parch marks"
in the grass of the Abbey Orchard. The cloisters are visible top left. Of the buildings which housed and protected the monastery few survived the dissolution of 5th December 1539 and the demolition which followed. The buildings surrounding the Great Court were reserved by the crown and survived for nearly two centuries. These consisted of the great stables on the west, guest houses on the east and the Water Gate on the south. This is the only building to survive. It was built c.1365 after its predecessor had been destroyed in the great storm of 1362. Originally the roof was of lower pitch than that of today and covered in lead.The gate served in part as the Abbots prison and in 1381 the gate keeper opened it to the insurgents who released the four prisoners then in custody, one of whom must have upset them for him they beheaded and set his head on the pillory in the market place. In 1357 the Abbey received a licence to crenellate, from the crown. In effect to become a castle and was surrounded by a strong precinct wall. A scar on the east wall of the great gate shows the height of this wall here, as shown on a map of 1634.
was situated near the bridge towards the south-east corner of the precinct. Its exact site is not known and excavations, at a location proposed in the 19th century, revealed no trace of a gate.